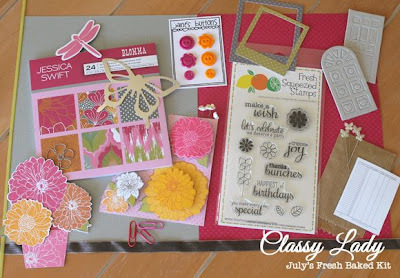 I'm back today with another CASual Fridays Stamps New Release sneak peek!!! Love this stamp as always Michele did her magic with the sentiments...Boy oh boy! She rocks at it!!! I used Echo park papers and Timeless twine for this card. Just added a few rhinestone for festive sparkle. This set has all the fun Holiday stuff...wonderful borders, super fun sentiment, this set can be used for non- holiday cards too!!! Christmas Card Challenges: Make your own Background. Going Grey With Scrap-Creations : Anything Goes. Top Tip Tuesday: Spooled items. How fun is " Atleast you Made the list"???.... lol!!! 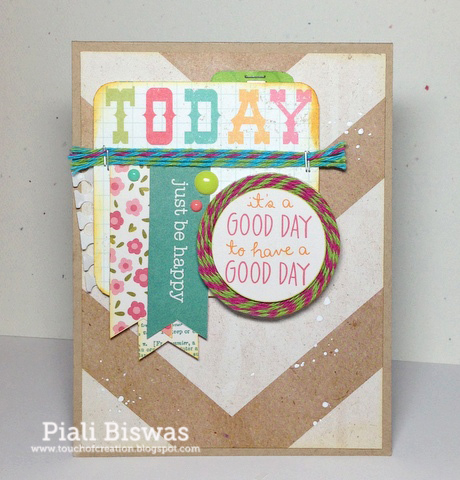 Its simple scrappy card with fun sentiment stamping! All papers and stickers are Simple Stories. Cards For Men : Christmas in July. Merry Monday: Anything Goes + Christmas. 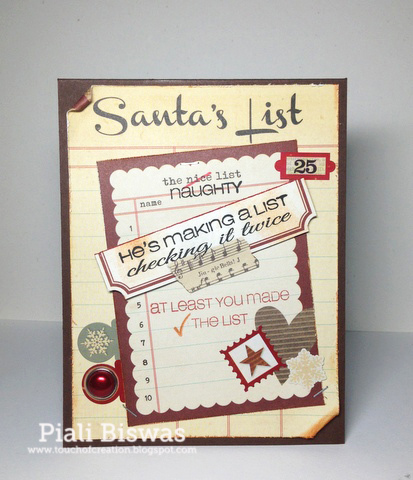 Make sure to stop by the CFS Blog for your chance to win this fab holiday stamp set. Welcome to Day #3 of CASual Fridays Stamps New Release sneak peeks!! Its not another oval die for sure, I think Michele came up with a very unique design, atleast I have not seen something like this before! I♥♥♥ this tag , you will see me using it a lot this year's holiday projects!! Can't tell much but there are few other peeks in it too.. I created a stamped background using a new CFS holiday set to be release on this Friday and then layered it with vellum. Dry embossed the second diecut layer ,applied stickles to it. 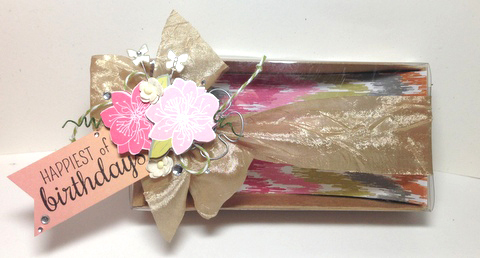 Lovely silk ribbon & jute twine are from May Arts. Craft-Dee BowZ: Anything Goes with handmade bow. Anything But A Card Challenge : Anything Christmas. Holly Jolly Christmas Challenge: Tag It. You all know the drill by now....hop over to CFS Blog to win this unique Oval Tags Fri-Die!!!! Its day#2 of CASual Fridays Stamps New Release Sneak peeks!!! A super fun shaped nested die set!!! A CAS holiday card !!!! Guessing about the sentiment....its a peek of another new release...coming soon!!! Hiding in my Craft Room: Christmas in July. 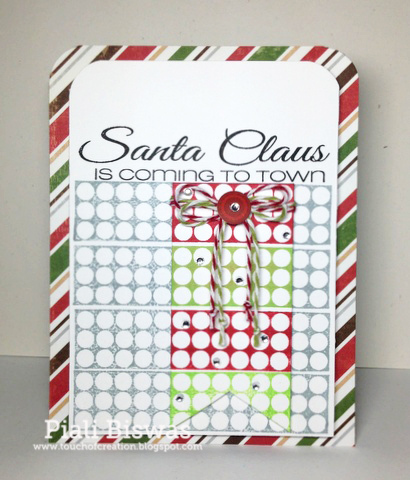 Card Crafter's Circle:Christmas in July. 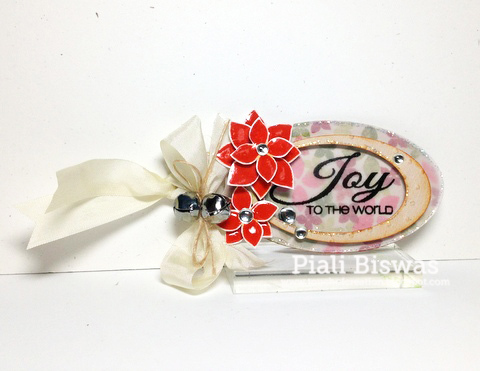 Creative Corner : Christmas in July. I ♥♥♥ this mini card!!! The sentiment is from CFS-Stop stamp set. Pile It On : Anything Goes. Eclectic Ellapu : Anything goes. Don't forget to check out CFS Blog for chance to win this amazing Fri-die . See you same time tomorrow with another fun peek!!!! I'm having a purging Sale....lots of stamps are up for grab!!!! Please Check HERE or the Crafty Sale tab. Hello and Happy Sunday Everyone!!!! Michele has some fun new stuff for us. Yes! Its NEW matching Dies !!! Today we're showcasing the Loving Blooms Fri-Die , a beautiful layered flower die that coordinates with CFS Loving Thoughts stamp set. I used heavy vellum for my flower...embossed it with Swiss Dots EF. For the background I used Amazing CFS- Zigs & Zags set. The sentiment is from CFS- Beanstalks set. 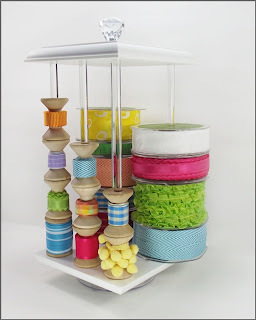 One Stop Craft: Add flowers or ribbon. Paper Crafting Journey : Punches/Diecuts. Make sure check to hop over to CFS Blog to check out the Ah-mazing DT Creations and chance to win this beautiful Fri- Die!!!! Triangles are super Trendy now....so I stitched few Twine-tastic triangles with new Key Lime twine. 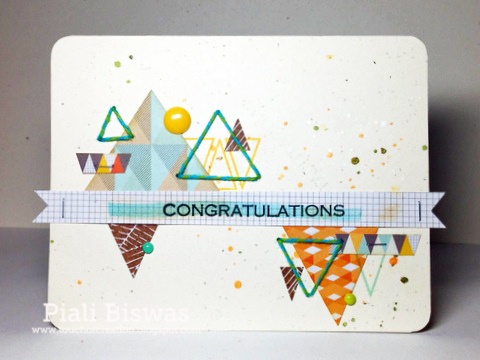 Just trimmed some triangles from Studio Calico papers and used them with the Paper Smooches stamp for this card. Moxie Fab World: Trendy Triangles Challenge. Dutch Dare Card Challenge : Institches. Sister Act Card Challenge :Anything Goes. 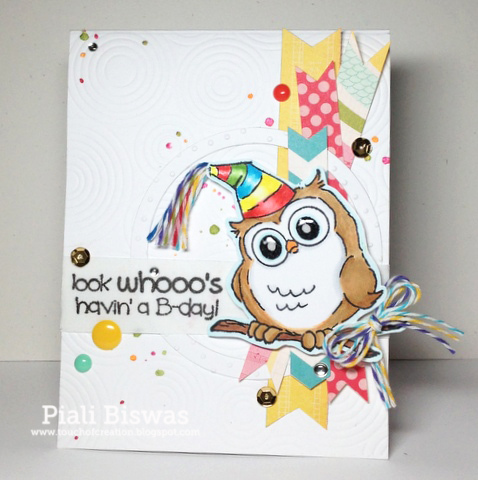 Welcome to Timeless Twine SORBET collection new Release bloghop!!!! Stacy just released AWESOME new collection of Yummy colored twines and we DT girls are celebrating it with our Twinetastic creations!! You find them at TT shop now.....check HERE. Each color will be on sale for $8.00, the set will be on sale for $21 and small party pack $4 .....just for the day!!! I ♥♥♥ the new colors...they are amazing !!!! I used Papers and Journalling cards from three different paper companies for this card...Studio Calico(background paper), Echo Park(Journalling card and sentiment) and Pebbles( Banners ). Don't you just love these new Twines??? Now the fun part ...whats a hop without prize? One prize per winner so there will be 5 winners total! Playing Along with this month's RCC#83 challenge!! Celebrate your Heritage, show your country pride and celebrations. The stamps are from Lawn Fawn. I used a lil' bit of Twine and lots of stickles for this card. Mema's Crafts Monday Challenge: Red , White & Blue. Scrappy Frogs: Red , White & Blue. Scrap It Girl: Red , White & Blue. You can play along with RCC #83 to win the fabulous Ribbon Carousel!!! Welcome to the Sparkle Creations Rubber Stamps 3rd Anniversary Hop! Today we're here to help Sparkle celebrate 3 years of Sparkle Creations Rubber Stamps!!! SCRS is officially releasing 4 new SCRS images this month -- Paris Lucy, London Charlotte, New York Josh, and Seattle Chloe. They are ALL available in the store NOW! We have assembled an all-star lineup consisting of our Current Design Team, DT Alumni and Guest Designers for this hop!! I'm so glad I'm one of them! I♥♥♥ SCRS images...super fun to create with..
Chloe is my most favorite female SCRS image and I'm from East Coast.. New Jersey!! What do you think!! Its worth a trip??? First create a reverse mask by cutting out Chloe part , then put the mask on and stamp Chloe image..this way you will only get Chloe image( without the Seattle background). Then create a mask and mask the Chloe image, then ink up the New York Josh image and with the help of cotton swab dipped in stamp cleaner solution CAREFULLY wipe out the Josh part . Then stamp it over the Chloe mask. Then there is the NEW image. I had to draw a few lines using the fine black marker to make it seamless. Hope you like what I did here!!! I love how it turned out!!!! The DPs are from Crate Paper- The Pier collection. I used a lil' bit of Timeless Twine to tie the charm. I completed the sentiment with some Alpha Stickers. Annabelle Stamps Challenge: Polka dots. What's a hop without prizes? We've hidden TEN single stamp prizes along the way and one lucky winner will win the ENTIRE July release! All you need to do is leave some love at every stop along the hop. You have until 11:59 PM EST on Sunday to leave comments for a chance to win! Winners will be announced on the SCRS blog on Monday. There are some days when you are just super happy with what you've created...I'm having one of those today!! Look at the cuuuuuute face!! Aww!! This cutie is from THIS Art Impressions Stamp set. I really love how the card turned out...perfectly how I wanted it to look like...a party in itself!!! I used Timeless Twine baker's twines and Echo Park-Sweet Girl papers!!! Did a bit of dry embossing and die cutting too. I embellished the card with some sequins, gemstone sticker and My Mind's Eye enamel dots. Also added some splatters with Heidi Swap Mist. 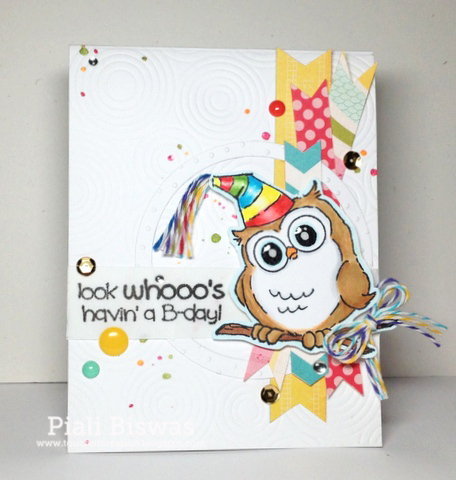 Moxie Fab World: Birthday Card challenge. Seize the Birthday: Anything Goes Birthday. If you want to play along with Ai Twine Time Challenge...check it out HERE. 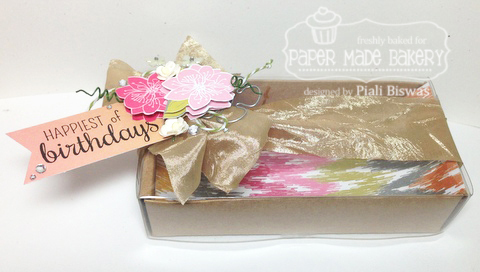 I upcycled a pen box with the lots of embellishments from the "Classy Lady" kit. 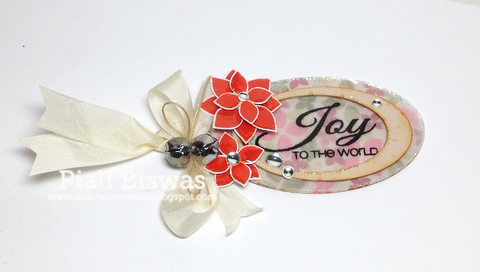 Added a tag with the lovely sentiment from Fresh Squeezed stamp (included in the kit). Also added some pretty patterned paper inside. Moxie Fab World: Tags & Wraps Challenge. Simon Says Stamp: Pin It. Simon Says Monday Challenge: Green...I upcycled a box. Stampin With The Dragon : Anything Altered. I looooooooove this pretty " CLASSY LADY"kit. I ♥♥♥ this cute Balloon Animal from Avery Elle stamps. I used Timeless Twine baker's twine to tie my Balloons. 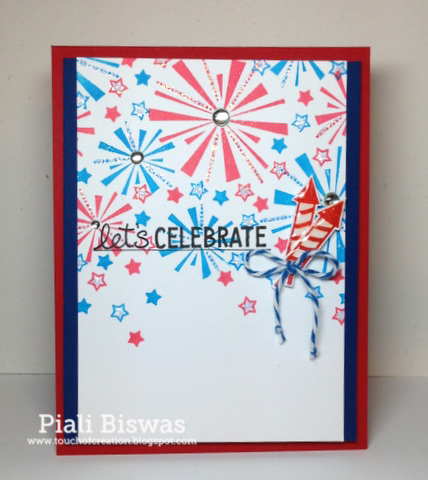 A Simple card for a fun celebration!! This card for the following challenges..
Charisma Cardz : No DP. Today I made a card just for this FUN sentiment!!!! This sentiment is sooooooooooo perfect.....lol!!! Ai images are not the only amazing stuff , Ai sentiment ROCKS too!!!!! I used Timeless Twine 's Aqua and Yellow Baker's twine. Love to Scrap: Anything Goes. 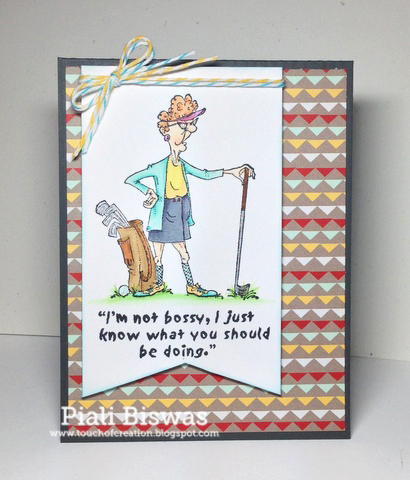 Lady Anne's Stamp Challenge: Anything goes. Did you see the new Ai challenge this week!!! Just check it out HERE. I wanted to play with the Mojo Monday 300th sketch. Its big celebration going on there...if you have missed it , go check it HERE. 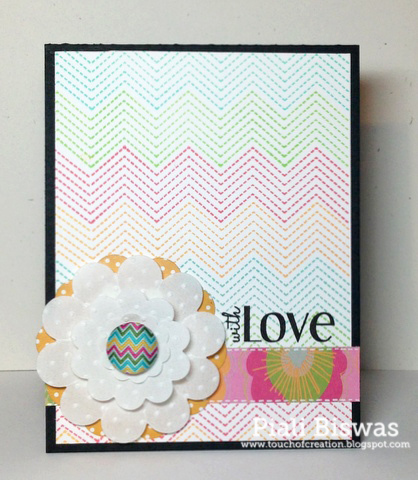 I used my new Verve Stamps for this card.. I got them a while ago but didn't get a chance to ink it. Verve stamps used: Teachers Count and Blue Skies. Its almost a all white cardstock card...only added a lil' grid DP from Studio Calico. Bloggers: Create your own Background. 4 Crafty Chicks: Dry embossing.